The rules for mortars are a bit strange, you need to roll a 6 on a D6 for a hit and then a 5 in the next turn if the targeted unit hasn’t moved. Lowering the needed result to hit by 1 each turn. Once a mortar has scored a hit it is ranged in and will only need to roll a 2 to hit in the subsequent turns unless the targeted unit moves. When a unit has moved the result needed to hit is reset to a 6 but there is no clear rule in how much a unit should move so if a unit only moves half an inch the to hit roll is still reset to a 6 which is a bit odd. You can take three kinds of mortars like any other unit in the game i.e. inexperienced, regular or veteran. Since a mortar fires indirect rounds you do not get the -1 penalty to hit for inexperienced units. The only difference is that an inexperienced unit might suffer from the lower morale to come from reserves and thus delaying to come on the table for 1 or 2 turns if you’re unlucky. The other downside of taking an inexperienced unit instead of a regular or veteran is that they die more easily but since they are usually deployed near the backline they don’t get shot that often other then by forward deployed snipers and the opponent’s mortar. Putting your mortar behind hard cover or out of direct sight works great since you can use the Spotter to mark appropriate targets for the mortar crew they can’t see themselves. I always opt for the inexperienced mortar crew since the point cost is lower and I always add a spotter. Some Bolt action gamers call this “gamey” or not in line with how the game was intended but the rules are very clear about this. With the inexperienced crew you save a few points in cost but take some risk when it comes to taking (easy) casualties and coming from reserves, the 15 points difference is about right for that I think. 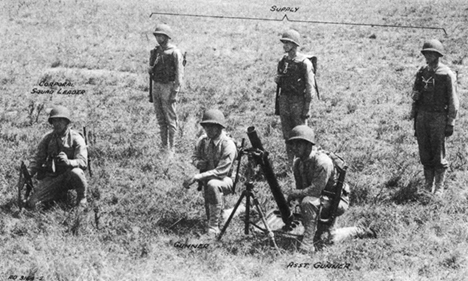 The M1 81mm mortar was the largest weapon in the arsenal of the Marine infantry battalion. It provided the battalion commander with a powerful and flexible indirect fire capability. Four of these weapons were assigned to each battalion, in either the weapons or headquarters company, depending on the table of organization. Sometimes called "infantry artillery," or "hip pocket artillery," mortars were capable of quickly laying down heavy barrages. These could stop enemy attacks under the worst conditions. Able to fire at high angles, mortars could fire at targets in defilade, either under direction of an forward observer, or firing off map coordinates. In the Pacific campaigns, these weapons became an important part of the battalion's firepower, especially since they could be man-packed into positions that were inaccessible to artillery. The M1 81mm Mortar was a smoothbore, high-angle fire, muzzle loading weapon. Several types of ammunition were issued for use with the 81mm mortar. All were fin-stabilized and came as complete units with fuzes already attached. The most common was the M43A1 high explosive round, with a weight of 7.05 lbs and containing 1.22 lbs. of TNT. Equipped with a superquick fuze, this round had a bursting radius of about 30 yards was commonly employed against enemy troops in the open. For dug-in or fortified enemy positions, the M56 high explosive round was available. Weighing 10.77 lbs, and with 4.30 lbs. of TNT, this round could be set for impact detonation, or for a short delay to enable it to penetrate before exploding. When used against troops in the open, it had a bursting radius of about 35-40 yards. Also available was the M57 chemical round. Filled with white phosphorous, this round was used for screening and obscuration and weighed 11.59 lbs. 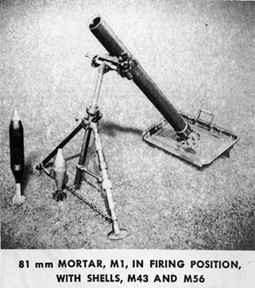 As an infantry weapon, the M1 mortar could be broken down into three separate loads. These were the barrel, weighing 44.5 lbs, the base plate, weighing 45 lbs, and the bipod, weighing 46.5 lbs. The M4 collimator sight fitted into a bracket on the bipod yoke, providing accurate laying for elevation and deflection. Aiming stakes were supplied in the basic issue items for each mortar, enabling the crew to lay their weapon on target for indirect fire. Throughout the war and beyond, the four gun configuration remained standard for the platoon, which was split into two section of two tubes each. Two lieutenants were assigned to the platoon. One was the platoon leader and the other the assistant platoon leader. A gunnery sergeant served as the platoon sergeant and the sections were each led by a platoon sergeant. The mortar squad was the basic sub-unit within the 81mm mortar platoon, with a corporal as the squad leader. The following additional Marines were assigned to the squad: one gunner, one assistant gunner, and four or five ammunition bearers.